The Committee For A Constructive Tomorrow (CFACT or the Committee) is pleased to submit the following comments in response to the Environmental Protection Agency’s 2012 Proposed Federal Plan and Model Rules for the Clean Power Plan, as issued by EPA and published in the Federal Register: 80 FR 65979-80. With headquarters in Washington, DC, the Committee is a 501(c)(3) national and international environmental and educational organization dedicated to protecting both wildlife and ecological values and the needs and aspirations of people, families and communities. We thank you for this opportunity to present our analyses and concerns, as CFACT, its members and supporters, our families, and the people we represent and assist will be adversely affected by EPA’s decision to declare that carbon dioxide and other greenhouse gases endanger human health and welfare, and must therefore be regulated under the Clean Air Act and Clean Power Plan. The Proposed Federal Plan and Model Rules for the Clean Power Plan and other EPA rulemakings will sharply curtail the use of coal and natural gas in generating electricity. They will thereby adversely affect job creation and retention; the price and availability of the energy, food and consumer products we need in our daily lives; and the health and welfare of millions of families, especially poor, minority and blue-collar families in states that currently rely on coal and natural gas in generating electricity. From CFACT’s perspective, EPA’s Clean Power Plan is not warranted by the Clean Air Act or evidence relied upon by the Agency. The plan will harm human health and welfare, but do nothing to improve environmental quality or prevent climate change, much less “dangerous” climate change. Indeed, EPA’s rules themselves present a far more serious threat to the health, welfare and pursuit of happiness, justice and civil rights progress of our members, the people we represent, and all Americans – than do any reasonably foreseeable manmade climate and weather changes. Our detailed analysis follows. The Environmental Protection Agency’s new Clean Power Plan (CPP) requires that states reduce their electric utility sector carbon dioxide emissions an average of 32% below 2005 levels by 2030. EPA devised its authority for the CPP by converting 80 words in the Clean Air Act into 2,690 pages of regulations and appendices. The unprecedented plan requires that utilities return the nation’s overall CO2 emissions almost to 1975 levels, while our population grows by a projected 40 million over the next fifteen years. Some 30 states will have to slash their power plant CO2 emissions by more than 32 percent; at least 12 will have to implement 40-48 percent reductions. That is a tall order, a near impossibility, since all those states now get 50-96 percent of their electricity from coal, and all of them depend on coal plus natural gas for nearly all their electric power. Mandating that transition and requiring that these states convert 20 percent or more of their electricity generation to expensive and unreliable wind and solar energy by 2030 will be disastrous. It will raise energy costs dramatically and seriously harm families, businesses, industries and communities. Electricity rates will likely rise from the 8-9 cents per kilowatt-hour currently paid in coal-reliant states at least to the 15-17 cents/kWh in “green energy” states like California. They could skyrocket to the 36-40 cents/kWh now paid in Denmark and Germany (70-80 cents when taxpayer subsidies are included). Those rising electricity rates will affect everything people make, grow, ship, eat and do – just as they have in Europe. They will impair people’s livelihoods, living standards and life spans. Poor, minority and working class families will have to find hundreds of extra dollars per year to pay these rising energy bills, even as more Americans end up living below the official poverty line and median family incomes have declined by more than $3,000 per year since President Obama took office. Small businesses will have to find thousands of dollars every year, just to keep the heat and lights on, without laying more workers off. Factories, malls, school districts, hospitals and cities will have to pay millions more, while trying to pay pensions and other rising costs. This is unsustainable. Under the CPP, everything business owners, workers, families and communities strived for their entire lives will be at risk. Millions of workers will lose their jobs, leaving more families destitute and welfare dependent, with a lower sense of self-worth. Many will have to choose between buying food and gasoline, paying the rent or mortgage, going to the doctor, giving to their church, or saving for retirement. Studies clearly show that tighter finances bring serious adverse consequences. As their household budgets are reduced by the CPP’s impacts, families will face more sleep deprivation, greater stress and depression, and more drug, alcohol, spousal and child abuse. More people without jobs and living on the margins will bring more theft and robbery. Constricted budgets mean nutrition and medical care will suffer, and more people are likely to have strokes and heart attacks, die prematurely or commit suicide. More elderly people will be put at risk from hypothermia, because they can no longer afford to heat their homes properly. Contrary to EPA statements regarding the dangers of global warming, cold weather kills 20 times more people than hot weather – and recent winters have been long and cold in much of the United States, Europe and elsewhere. In Britain, thousands of pensioners now die of hypothermia every winter, because soaring energy costs have made it impossible for them to afford adequate heat. To cause that to happen here in the USA would be immoral and unconscionable. Instead of acknowledging any of this, EPA has employed a deceptive “social cost of carbon” analysis that places arbitrary inflated costs on damages the agency claims result from alleged climate risks from using carbon-based fuels. These calculations include every imaginable and imaginary cost of using fossil fuels – while completely ignoring the enormous benefits of utilizing coal, oil and natural gas. Indeed, fossil fuels facilitated successive industrial revolutions and now enable billions to live better than royal families did a mere 150 years ago. They have helped average incomes increase eleven-fold, and helped average global life expectancy to soar from less than 30 in 1870 to 71 today. They have made U.S. factories, schools, hospitals and living standards the envy of the world. Ignoring all these benefits, EPA even claims its anti-energy Clean Power Plan will reduce asthma rates. However, asthma rates have increased slightly, while air pollution has declined. This underscores that asthma hospitalizations and outdoor air pollution levels are not related. The real causes of asthma are allergies, a failure to expose young children to sufficient allergens to cause their immune systems to build resistance to airborne allergens, and lack of sufficient exercise to keep lungs robust. The CPP will obviously do nothing to change those dynamics. Reducing access to affordable, reliable electricity will further exacerbate our nation’s untenable unemployment and welfare situation. More than 94 million Americans are not working, and the labor force participation rate is the lowest in 38 years, with barely 62 percent of the U.S. population either holding a job or actively seeking one. Nearly 8.5 million Americans do not have jobs, some 40 percent have given up even looking, and more than 6 million are involuntarily working one or more jobs part-time, because they cannot find full-time positions. Millions of families are living on the edge. More than 120,000 primary and secondary jobs have been lost in America’s coal-producing states since 2008, the majority of them because of onerous EPA regulations. Dozens of coal mining companies have filed for bankruptcy, and the market value of the remaining companies has plummeted. World events are making it increasingly difficult for companies to stay in business and workers to support their families. Anger, frustration and despair in poor, minority and blue-collar communities are understandably rising. Increasing electricity and regulatory compliance costs are a major factor in all of this, and the Clean Power Plan will only make the situation worse. In effect, EPA is trying to protect people from conjectural, exaggerated and illusory climate risks years or decades from now, by increasing the economic problems, anxiety, and health and welfare woes they already face. That is intolerable and unconscionable. The Clean Power Plan will also impair environmental values. Sprawling wind and solar installations and transmission lines already impact millions of acres of agricultural, wildlife and scenic areas. Huge wind turbines and solar facilities already kill millions of eagles, hawks, other birds and bats every year. The Clean Power Plan will make this situation far worse, by forcing states to build more, increasingly larger wind and solar facilities, increasingly in sensitive wildlife habitat areas, which are often the best remaining areas for abundant wind and sun. Just as bad, the electricity they generate is expensive and unreliable and unable to replace conventional 24/7/365 coal- and gas-based electricity. Vast stretches of croplands and wildlife habitats have also been plowed under to grow corn, switchgrass and other plants for ethanol and other biofuels. At a time when we have abundant supplies of oil and natural gas that can be produced more efficiently, at lower cost, with fewer carbon dioxide emissions via fracking and conventional means, more than 40 percent of the nation’s corn crop is now being turned into ethanol. This makes no sense. But it too is required under EPA’s various climate control plans. Our planet’s climate has changed regularly throughout earth and human history, in response to powerful, interconnected natural forces that humans cannot control. There is no evidence in the climate or weather record that government will ever be able to control climate and weather by limiting the amount of plant-fertilizing carbon dioxide that humans emit into the atmosphere. Indeed, contrary to EPA claims about carbon dioxide being a “dangerous pollutant,” more CO2 in Earth’s atmosphere will improve crop, forest and grassland growth, even during prolonged droughts and cold periods. This is already occurring, as witnessed by the increased “greening” of the Sahel and many other regions, improved forest and crop growth across our planet, and other phenomena recorded by the Center for the Study of Carbon Dioxide and Global Change and many other researchers. Moreover, hurricanes and tornadoes, storms, droughts, polar ice and sea levels are all within the realm of historic experience. There is nothing dangerous or “unprecedented” about them, nor is there any evidence that CO2 is “acidifying” oceans that are and will remain firmly alkaline. There is certainly nothing to justify shutting down our carbon-based energy system, dramatically increasing energy costs, transforming our economy, destroying millions of jobs, and impairing human health and welfare. In fact, contrary to computer model predictions, average global temperatures have not budged by more than a couple hundredths of a degree in nearly 19 years. In fact, the climate models consistently misrepresent past temperature and climate trends and predict much greater warming than Earth has actually experienced. That makes the models, and the assumptions behind them, invalid. Meanwhile, October 24, 2015 marked a full ten years since a category 3-5 hurricane last hit the United States. (Hurricane Wilma in 2005; Sandy hit as a Category 2.) That’s a record dating back at least to 1900. It’s also the first time since 1914 that no hurricanes formed anywhere in the Western Atlantic, Caribbean Sea or Gulf of Mexico through September 22 of any calendar year. Seas are rising at barely seven inches a century. Droughts and other “extreme weather events” are less frequent, severe and long-lasting than during the twentieth century. Polar ice is freezing at or above historical rates in the Arctic and Greenland, and at a record pace in Antarctica. Polar bear numbers are at record highs, having risen from 5,000 worldwide 65 years ago to more than 25,000 today. Moreover, as Secretary of State John Kerry admitted in Paris, even if all the industrialized nations’ CO2 emissions declined to zero, “it wouldn’t be enough [to prevent alleged climate disasters], not when more than 65% of the world’s carbon pollution comes from the developing world.” And that assumes carbon dioxide has replaced the powerful natural forces that have always controlled climate and weather. Once again accepting the false claim that carbon dioxide does drive climate change, all the regulations that EPA is promulgating would prevent an undetectable 0.018 degrees Celsius (0.032 degrees Fahrenheit) by the end of the century, climatologists Patrick Michaels and Paul Knappenberger have calculated. The Clean Power Plan alone would achieve only a fraction of those trivial benefits. EPA relies heavily on NOAA, NASA, IPCC and other agency data and studies that can only be characterized as misleading or even deceptive. To cite just one example, a recent NOAA study claimed that global warming has not stalled for almost 19 years. 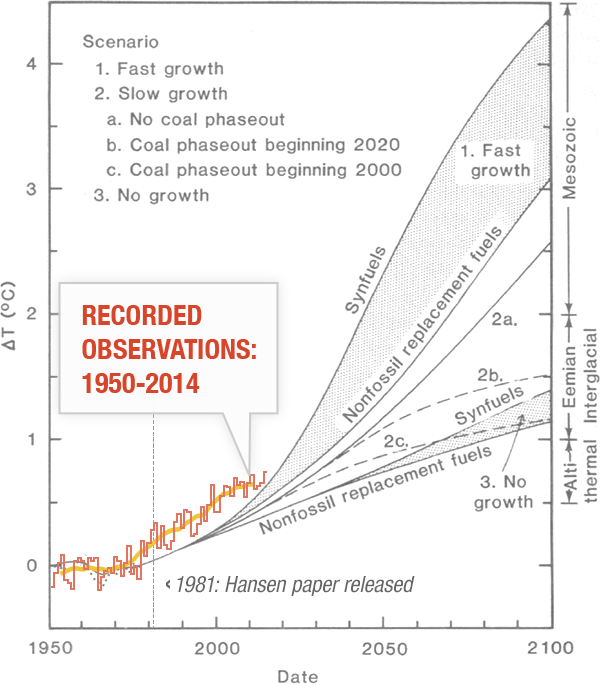 That stall or hiatus is confirmed by satellite records, and is contrary to all computer climate model forecasts. To get this result, the NOAA study adjusted sea-surface temperature data from a global network of buoys upward by 0.12 degrees Celsius (0.25 F), to “homogenize” the buoy data with records from engine intake systems on ships – and thereby create a previously undetected warming trend. 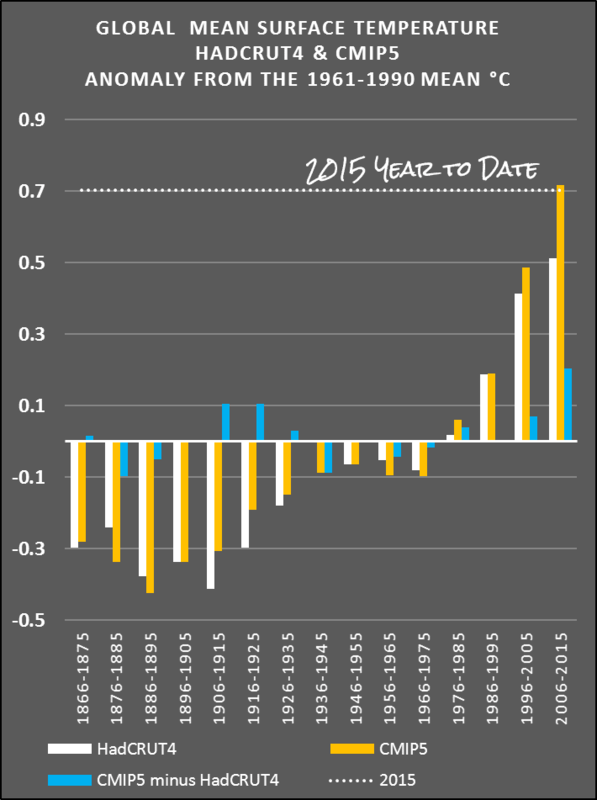 (That alleged warming trend was a bare few hundredths of a degree, less than the margin of error in NOAA’s review.) However, the intake data were contaminated by heat from the ships, rendering them invalid, whereas the buoy network was designed for accurate environmental monitoring. A more accurate, defensible study would therefore have adjusted the ship data downward, to homogenize them with the more reliable buoy data. The fact that this was not done casts further suspicion on the “science” behind EPA’s Clean Power Plan. In addition, in promulgating its Clean Power Plan and other regulations on climate change, EPA has clearly violated Office of Management and Budget and other guidelines on “Peer Review for Influential Scientific Information” and “Highly Influential Scientific Assessments.” Its regulations clearly have significant impacts on the U.S. economy, jobs, the environment, and human health and welfare. And the IPCC, NOAA and other studies used to justify those regulatory actions are clearly “influential scientific information” and “highly influential” scientific assessments, for which wide ranging peer review by experts outside the closed circle of government and government-financed scientists was required. EPA’s failure to abide by these clear rules makes its Clean Power Plan and other actions improper and arguably illegal under government laws and guidelines. At EPA’s behest, the Justice Department has sued Volkswagen. The government is seeking up to $18 billion dollars in penalties, because VW installed special software that caused its diesel cars to emit fewer pollutants during tests used to ensure compliance with emission regulations. The falsified tests allegedly duped American consumers into purchasing thousands of diesel-powered vehicles. Federal prosecutors are also conducting criminal probes of Volkswagen and its executives. Former Boston crime lab technician Annie Dookhan was prosecuted for faking test results and contaminating drug samples, to get accused dealers convicted. Countless other civil and criminal investigations and prosecutions have companies and citizens in their crosshairs. Such actions are often warranted, even if the draconian incarceration and monetary penalties are not. A fundamental principle is at stake here: Government agencies and regulators must abide by the same standards and rules they expect citizens and corporations to live by. Policies and rules that affect our lives, livelihoods and living standards must be based on verifiable, replicable scientific evidence. No one should be victimized by misleading claims by private companies – or made by government agencies or scientists or third-party scientists whom they hire and use to validate policies and regulations. Equally important, no one forces us to buy a VW or any other car. But when it comes to laws and regulations, we have no choice. We must submit to them, or else. If those rules are based on dishonesty – on emission deception on a large, unprecedented level in the case of climate rules – we pay a huge, unacceptable price. That is exactly what is happening under EPA’s Clean Power Plan. Moreover, these rules are being promulgated in direct contravention and circumvention of the clear will of Congress, which has rejected nearly 700 climate bills, and in collusion with environmentalist pressure groups, via secretive emails, meetings and sue-and-settle lawsuits, in developing these regulatory edicts. That is contrary to federal law, our Constitution, the separation of powers and sound public policy. Carbon-based energy still provides 80 percent of U.S. and 81 percent of world energy. It supports $70 trillion per year in world GDP. Fossil fuels will supply 75-80 percent of global energy for decades to come, Energy Information Administration, International Energy Agency and other studies forecast. Carbon-based energy is essential if we are to bring electricity to the 1.3 billion people who still do not have it, and end the rampant poverty and lung, intestinal and other diseases that kill millions of people in poor countries every year. That is why thousands of coal-fired power plants are being built, under construction or in planning around the world. Britain plans to end all “green” subsidies by 2025, to reduce electricity prices that have sent millions of families into energy poverty and caused the loss of thousands of jobs in the UK steelmaking sector. Germany’s reliance on coal continues to rise; it now generates 44 percent of its electricity from the black rock – more than any other EU nation. In Poland, Prime Minister Eva Kopacz says nuclear energy is no longer a priority, and her country’s energy security will instead focus increasingly on coal. China now gets 75 percent of its electricity from coal. Its coal consumption declined slightly in 2014, as the Middle Kingdom turned slightly to natural gas and solar, to reduce serious air quality problems. However, it plans to build 363 new coal-fired power plants, with many plants eventually outfitted or retrofitted with scrubbers and other equipment to reduce emissions of real, health-impairing pollution. India will focus on “energy efficiency” and reduce its CO2 “emission intensity” (per unit of growth), but not its overall emissions. It will also boost its reliance on wind and solar power, mostly for remote areas that will not be connected to the subcontinent’s growing electrical grid anytime soon. However, it plans to open a new coal mine every month and double its coal production and use by 2020. China and India will not consider reducing their GHG emissions until 2030, and even then it will be voluntary and dependent on how their economies are doing. Pakistan is taking a similar path – as are Vietnam, the Philippines and other Southeast Asian nations. Even Japan plans to build 41 new coal-fired units over the next decade, partly to replace its nuclear power plants. Overall, says the International Energy Agency, Southeast Asia’s energy demand will soar 80 percent by 2040, and fossil fuels will provide 80 percent of the region’s total energy mix by that date. Africa will pursue a similar route to lifting its people out of poverty. The continent has abundant oil, coal and natural gas – and it intends to burn those fuels, while it utilizes wind and solar power in remote areas until they can be connected to the continent’s slowly growing electrical grids. All this fossil fuel use means the costly, painful, job-killing, draconian energy reductions required under EPA’s Clean Power Plan will have no effect whatsoever on atmospheric carbon dioxide levels, which will continue to climb, further greening the planet and spurring faster crop, forest and grassland growth. Even if we assume once again that carbon dioxide has somehow replaced the powerful natural forces that have always driven Earth’s climate and weather, the CPP will do nothing to stabilize, prevent or roll back global warming, global cooling, other climate changes and extreme weather events. The realities presented in these comments help explain why a December 2015 Gallup poll found that Americans view intrusive government regulation, our weak economy, unemployment and terrorism as the biggest threats facing our nation. Pollution came in at #23, and global warming didn’t even register among 48 listed issues. EPA’s Clean Power Plan ignores these realities and public concerns. 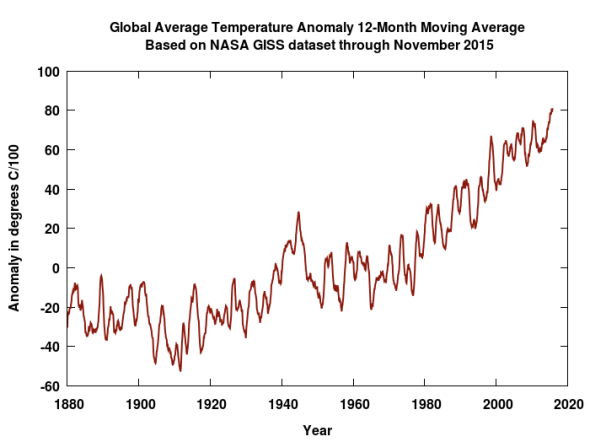 How much is Earth warming, if at all? How much of actual warming and other climate changes in recent decades are due to mankind’s use of fossil fuels and emission of greenhouse gases – and how much are due to powerful solar and other natural forces over which humans have absolutely no control? And will any changes be short-term or long-term … good, bad, neutral or catastrophic? At this time, there is no scientific evidence – based on actual observations and measurements of temperatures and weather events – that humans are altering the climate to a significant or dangerous degree. Computer models, political statements and hypothetical cataclysms cannot and must not substitute for that absence of actual evidence, especially when the consequences would be so dire for so many. Simply put, the danger is not climate change – which will always be with us. The real, immediate danger is energy restrictions imposed in the name of controlling Earth’s perpetually fickle climate. The Clean Power Plan will harm human health and welfare, wildlife and environmental quality, but will do nothing to prevent climate change, “dangerous” or otherwise. The Environmental Protection Agency needs to scrap its plan to implement its Clean Power Plan, and any “model rules” developed under the Plan. Craig, your article is spot on! I AM NOT ANTI GOV……..I am however anti gov ignorance and the EPA like so many gov agencies both state and fed are just to expensive, to many and to irresponsible to be trusted with law making ability…the congress is derelict, over paid and does not serve us well…they now need adjusted to term limits no retirement. I agree with most of your comments. However, while term limits have some merit., it is not the main solution to the problem. Congress makes new laws and regulations at only a fraction of those new laws that are promulgated by agencies such as the EPA, BLM and others. The agencies numbers are over one hundred and counting. These agencies issue regulations that only require that the agency print a new regulation into the federal register and if not contested by a corporation or a group within a short period of time ( I think one month) , will then allow that agency to resubmit the same regulation unchanged in the next issue of the federal register and at that time becomes the law of the land and is just as effective as a bill passed by congress and approved by the president. It other words is the law of the land. That is why the EPA and all agencies of the government are to be watched more than even the congress and president when it comes to limiting the rights of citizens. It also means that if there are term limits, some legislators wouldn’t get to know the ropes and have to leave congress since their term is up. All this doesn’t mean I appose term limits. Instead, term limits need to be discussed and reviewed closely before being made a law to eliminate the unintended consequences. What this also means is that these agencies need more oversight by congress or other entity to insure that the agency toes the line and doesn’t grab powers that are excessive and harm the economy and the health welfare and the economy of the US. It’s hard to believe such major decisions are made on such shoddy science. http://www.drroyspencer.com/research-articles/satellite-and-climate-model-evidence/ Yet they do, as this above paper by Dr. Roy Spencer shows, Earth is very insensitive to the effect of increasing CO2 NOT ry sensitive as the EPA, UN IPCC and others assume in their computer programs assume, garbage in garbage out. In this case , people, maybe you , can die because of it. Yes, thanks Peter. This article gives added cloud related evidence of the chemtrailing actually increasing warming doesn’t it? Anyone not recognizing the meme yet is probably not going to. I think it’s interesting that H. Obama is interested in the position of Secretary General of the UN when he’d be ineligible as a US born citizen. Typical HAARPer. The absence of contrails after 9/11 raised temperatures. So you are against models? Only the ones that are wrong every time in predicting that they were designed to predict. 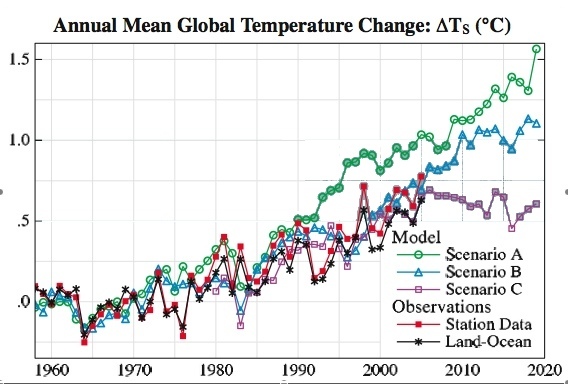 NO climate model has ever predicted anything correctly.Guess you were too busy to read Dr. Spencer’s paper…..
NO climate model has ever predicted anything correctly. Oopers! You were duped (willingly?). Here’s how the models are doing. A different look at latest run. An interesting depiction of latest run. Here’s how some older models are doing. And some older ones all together. And what several scientist said in the 1980s that was surprisingly accurate about Arab Spring. 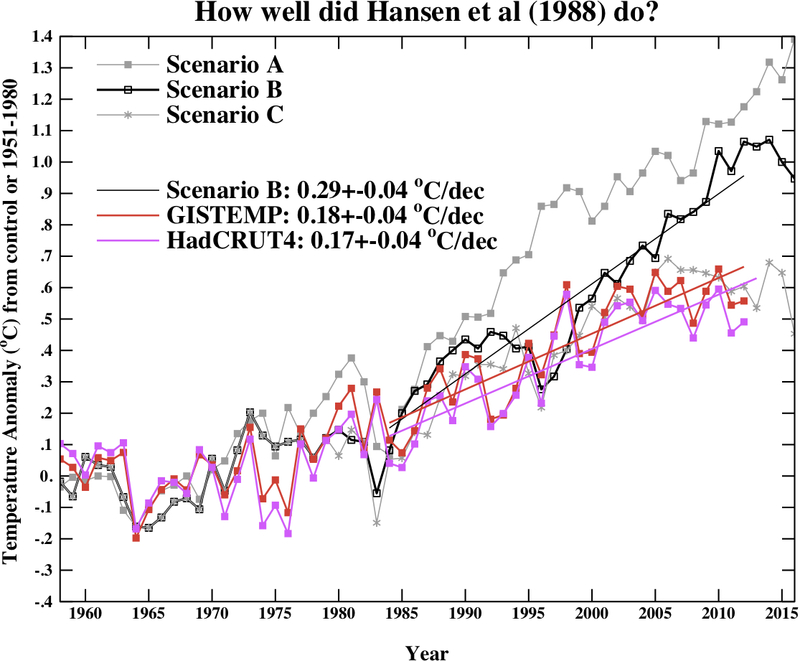 Here is the the very first climate projection from 1981, constructed from this paper. Pretty dang good, no? Not what the disinfo sites tell you, is it? Here is something from the 1970s that is surprisingly accurate as well. Heck, even Exxon scientists were pretty durn close in the early 1980s! That the troposphere would warm and the stratosphere would cool. That nighttime temperatures would increase more than daytime temperatures. That winter temperatures would increase more than summer temperatures. Polar amplification (greater temperature increase as you move toward the poles). That the Arctic would warm faster than the Antarctic. The magnitude (0.3 K) and duration (two years) of the cooling from the Mt. Pinatubo eruption. 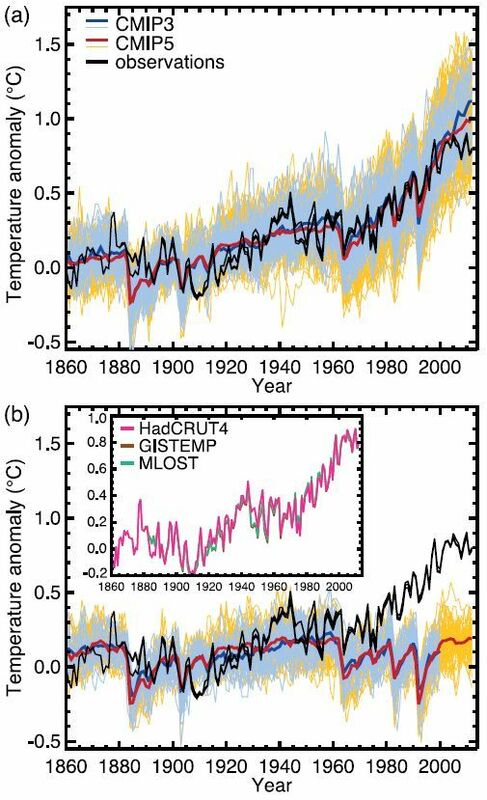 They made a retrodiction for Last Glacial Maximum sea surface temperatures which was inconsistent with the paleo evidence, and better paleo evidence showed the models were right. They predicted a trend significantly different and differently signed from UAH satellite temperatures, and then a bug was found in the satellite data. The amount of water vapor feedback due to ENSO. The response of southern ocean winds to the ozone hole. The expansion of the Hadley cells. The poleward movement of storm tracks. The rising of the tropopause and the effective radiating altitude. The clear sky super greenhouse effect from increased water vapor in the tropics. The near constancy of relative humidity on global average. That coastal upwelling of ocean water would increase. ** Full citation list found here (plus much, much more). Shut down the EPA and ALL other government agencies NOT found in the Constitution. This would be the EPA, DoEnergy, DoEducation, BLM, plus a whole raft of others. Shutdown the “Federal Reserve” which nothing more than a group of Greedy Bankers that have caused MORE recessions and depressions since 1913 than happened from the time our government was formed in 1776.
http://netrightdaily.com/2016/01/it-takes-a-criminal-to-know-a-criminal/ links to a Gallup Poll reveals that 75 percent the public believes that corruption is widespread in the U.S. Government : http://www.gallup.com/opinion/chairman/188000/explaining-trump-widespread-government-corruption.aspx . The EPA should be abolished A.S.A.P. Its only use is to provide the Government with another, in a long line of, tools with which to control the citizen; the Constitution not withstanding. All alphabet soup departments of the fed. government should be audited very closely and reduced in size and coverage to prevent misuse by potus, or other budding dictators. All remaining departments should, with no exception, be reduced by one half. The money saved could then be used to balance the budget, and the excess personnel could be absorbed into the private sector which is always in need of incompetent janitors. No, the EPA’s clean power plan is clean. You just want to pollute the environment, so you are making your ridiculous claims. Earth polluters! Does the truth hurt that much? I still don’t understand what is so bad about global warming. We do know that the warmer weather in the Mideval warm period was good for people and the cooling of the little ice age was pretty dam bad. So, where is the harm of the temp coming back up to the temp of those times. Get your head out in the clear air and enjoy the sunshine. Funny how that UN socialist panel and our own government-paid drones switched the name of their Global Warming scam to their new Climate Change hoax – after 20 consecutive years of GLOBAL COOLING! Now, the terms ‘social justice’ and ‘climate justice’ along with ‘sustainability’ are used instead of GW and/or CC. The UN and EU elite socialist Puppet Masters are desperate to reel in the Agenda 21/Agenda2030 and whatever before the ordinary citizens catch on to their “snake oil” and “bait and switch” scheme of deception. And Obummer is a big part of that deception. Nov. 2016 can’t happen soon enough. after 20 consecutive years of GLOBAL COOLING! But if it gets too hot, then it will be just as inhospitable as it was in the Ice Ages. It may even get hotter than Hell. Is that really what you want–a planet that is hotter than Hell like Venus is, or colder than a freezer like Mars is? As long as the planet continues in its current orbit at its current tilt, nothing is going to change. Karen, after spending 100 billion dollars on “research” your people have not provided any SCIENTIFIC proof that CO2 is harmful. In fact, we had better increase it or plants will stop growing. Hot houses are run at 1000ppm for better growth. Submariners can easily live in the 5000ppm range. And last but certainly not least is the fact that NASA has been measuring inbound/outbound radiation for 33 years. The outbound radiation back into space has been increasing slowly. One of three things must be happening: less clouds to inhibit the heat, NASA has been wrong all these years or the whole Global Warming/Change/Whatever is a giant HOAX!! your people have not provided any SCIENTIFIC proof that CO2 is harmful. Global Warming/Change/Whatever is a giant HOAX!! o but have been exposed by a few intrepid bloggers and fossil fuel billionaires. Has there ever been – ever – a less likely conspiracy theory ever than this one? In the history of the world? 30,000 SCIENTISTS, 9000 with PH’ds who signed the petition that the whole thing is suspect and not to be believed. (You can google this). 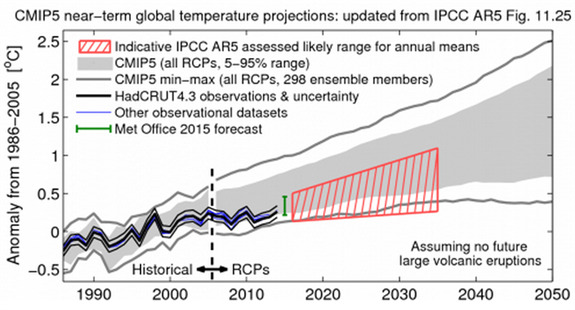 And everyone looks to the IPCC for belief, the IPCC that mainly is made up of environmentalists and whose “computer” models are so off the chart it is laughable. 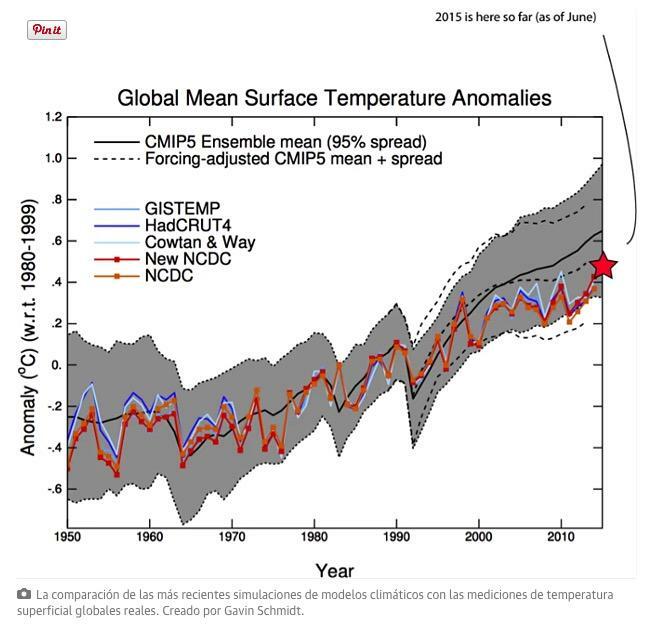 The same IPCC that refused to look at any other evidence other than “man.made”. Forget about that big round yellow thing in the sky. The IPCC who will not admit that water vapor makes up the bulk of atmospheric gasses, not the .039% attributed to CO2. And the fact that there has been no warming for over 19 years. and what warming we’ve had is the slow regression out of the last Ice Age. And never mind that the IPCC sort of forgot to add in the Little Ice Age and the hot spell that gave us wine on the Thames that would have buggered their “models”. OISM! Of two years ago! That’s my favorite denier joke! I LOLz every time I see it! Even after all these years! 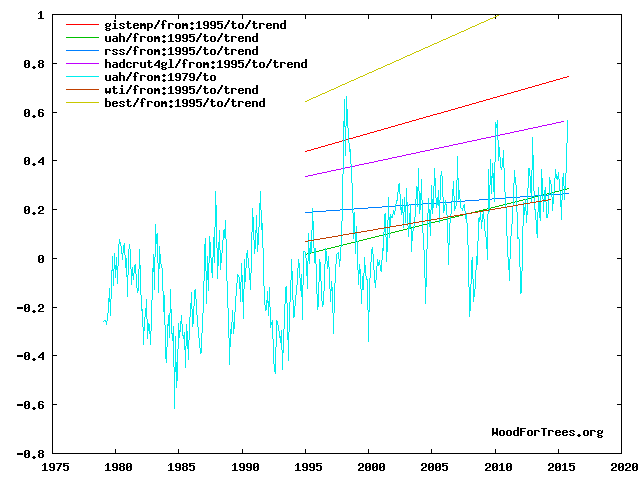 the fact that there has been no warming for over 19 years. Well Dano hahahaha, you’ve certainly drank the Kool aid. Are you aware that Russian scientists have discovered that NASA/NOAA has been “cooking” the books for years? They looked at NASA data on file in Europe and found that it wasn’t the same now as originally recorded. 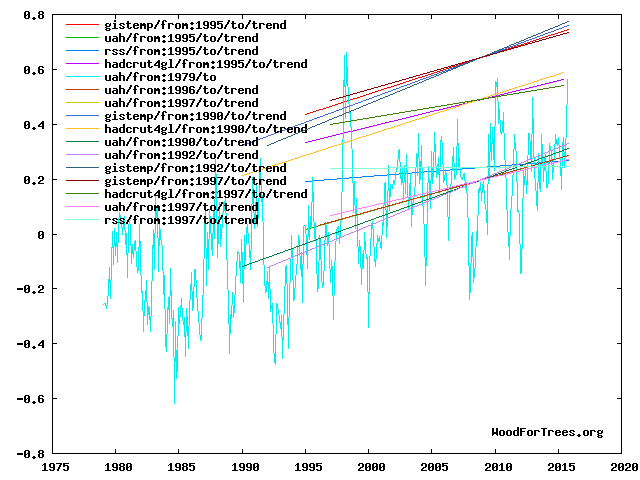 If the original data had been used there was actually a slight cooling trend over the last 20-30 years. Well that would never do would it. And why do they (NASA) ignore the satellite data? Because it doesn’t fit their agenda of “global warming” that obonzo is espousing? I bet you are involved some way in Big Research that is sucking on the 100 billion dollar government teat. I bet you don’t know about Adrian Vance and his book Vapor Tiger. For the record I get my information looked at by Professor Will Happer of Princeton who has testified before Congress many times on CO2 and the mythical “greenhouse” effect. Have you read any of Joseph Postma’s papers on the Second Law of Thermodynamics? While there is a mild amount of blocking by CO2, it is mostly an impossible task. And of course you’ve read the 30 years of studies by NASA on inbound/outbound radiation that show a slow increase of outbound radiation. This means either the AGW thingy is a hoax or their studies over the years are all wrong. I have another study that was written by a physicist with 6 doctorates that proves that increasing the CO2 will have little effect on anything. He compares it to a lake (radiation) with a damn and 4 outlets. You increase the radiation and all four outlets increase slightly, not just the CO2 outlet. OK Dano hahahahaha, I’m not spending any more time on this. I get my information from real scientists not al gore or dicaprio. (How come al gore bought a gadzillion dollar mansion in Montecito, CA that is just a few steps from the ocean if it is going to rise and flood the coasts?) And how come he will never answer questions on AGW? Anyway, Dano hahahaha I give up. My daddy told me that if you are in a battle of wits and your opponent is a half wit then you don’t have a chance. Justin Data! Will the right’s new heartthrob finally the THE ONE to validate their self-identity??!!? whose “computer” models are so off the chart it is laughable. “benefits are illusory” – The odd thing is they know very well there will be virtually no benefits. They have said so – Gina did in her Congressional testimony. “This is not about pollution control” – so it’s not about pollution – and it’s about “leadership” – on what I haven’t figured out, unless it’s to be the first lemming over an economic cliff – but there will be no others following. You apparently didn’t read what I wrote. Look at how hot Venus is. It has no life there. If Venus is hot, then it must have plants growing everywhere and herbivorous and omnivorous people and animals eating them.